Slip on this sleeveless, knit fabric top and shift into vacation mode or dress it up with a cute cardigan. Top has shoulder cutouts featuring a front self-tie knot. Slip on this sleeveless, knit fabric top and shift into vacation mode or dress it up with a cute cardigan. Top has shoulder cutouts featuring a front self-tie knot. Fabric is soft, comfortable and has good stretch. 60% Cotton, 40% Modal. 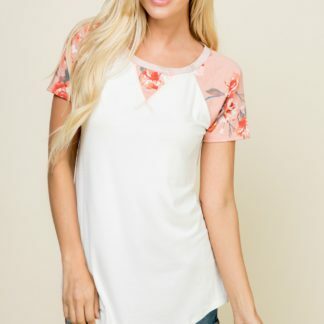 Model is 5`8″ and is wearing a size Small.